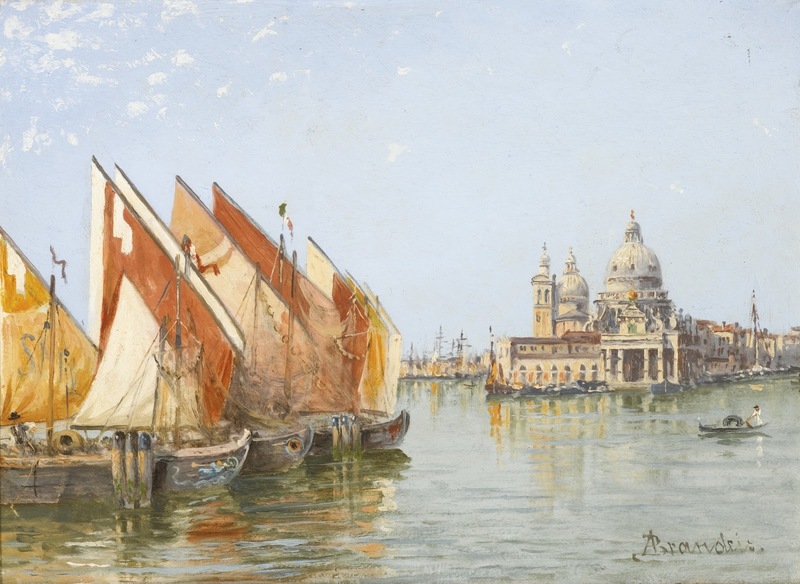 Antonietta Brandeis (1848-1926), was a Czech-born Italian** landscape, genre and portrait painter, as well as a painter of religious subjects for altarpieces. She was born on January 13, 1848, in Miskovice (near Kutná Hora) in Eastern Europe. The first bibliographical indication of Antonietta Brandeis dates from her teens, when she is mentioned as a pupil of the Czech artist Karel Javurek of Prague. 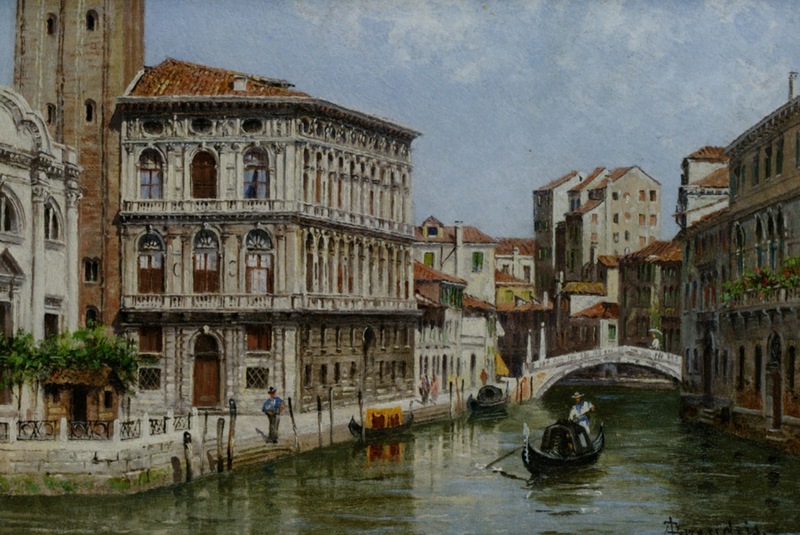 After the death of Brandeis' father, her mother, Giuseppina Dravhozvall, married the Venetian Giovanni Nobile Scaramella; shortly afterward the family apparently moved to Venice. 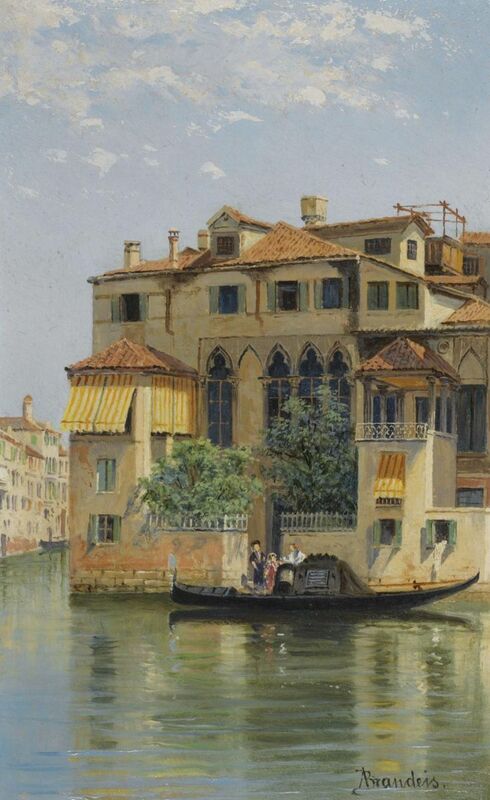 In the 1867 registry of the Venetian Academy of Fine Arts, Brandeis is listed as being enrolled as an art student. 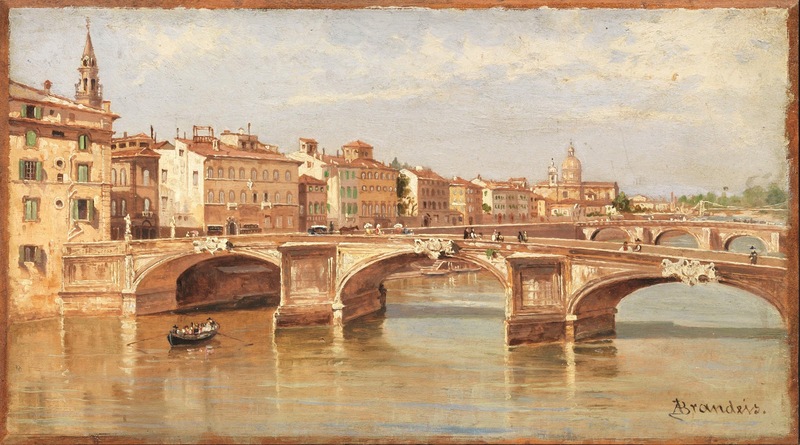 At this time, Brandeis would have been nineteen, and one of the first females to receive academic instruction in the fine arts in Italy. 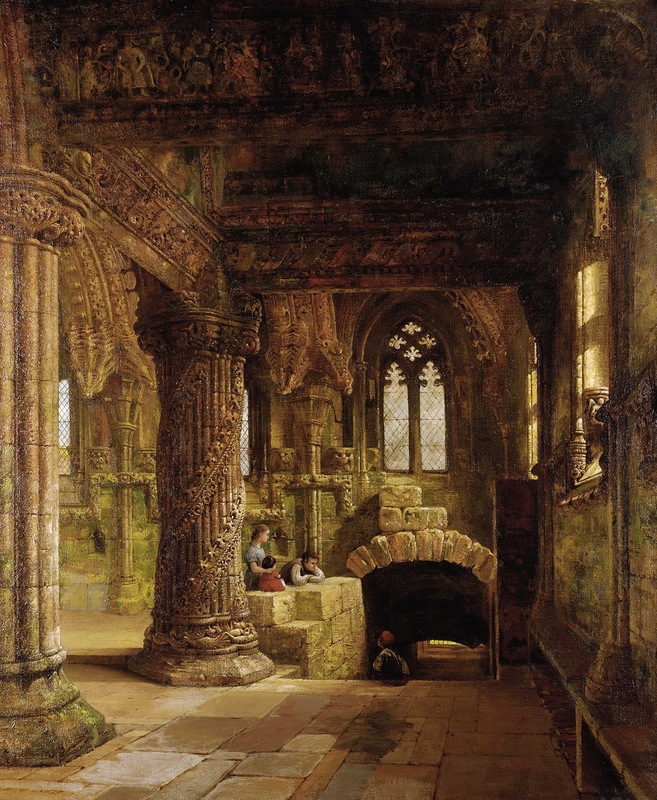 In fact, the Ministry granted women the legal right to instruction in the fine arts only in 1875, by which time Brandeis had finished her education at the Academy. 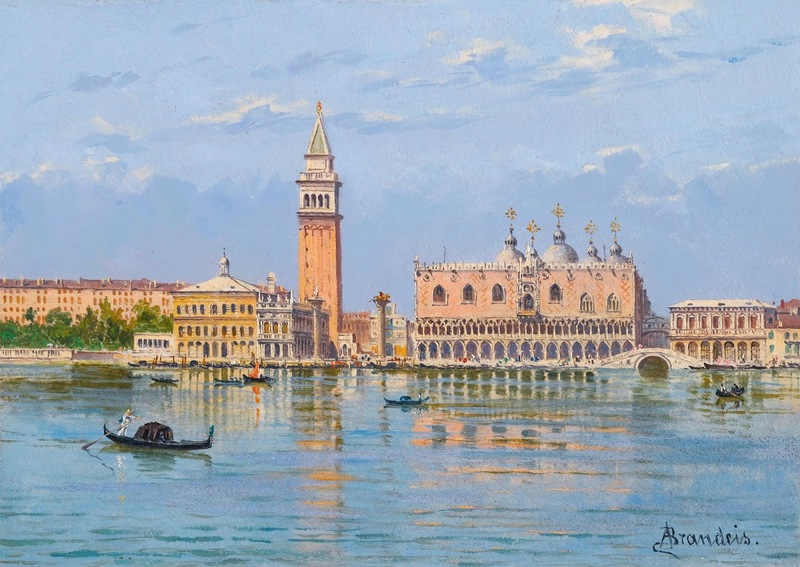 Brandeis’s professors at the Venetian Academy of Fine Arts include Michelangelo Grigoletti and Napoleone Nani for life drawing, Domenico Bresolin for landscape, Pompeo Marino Molmenti for painting and Federico Moja for perspective. Already during her first years of study there is evidence of Brandeis' skill-in her first year she is awarded** prizes and honors in Perspective and Life Drawing. 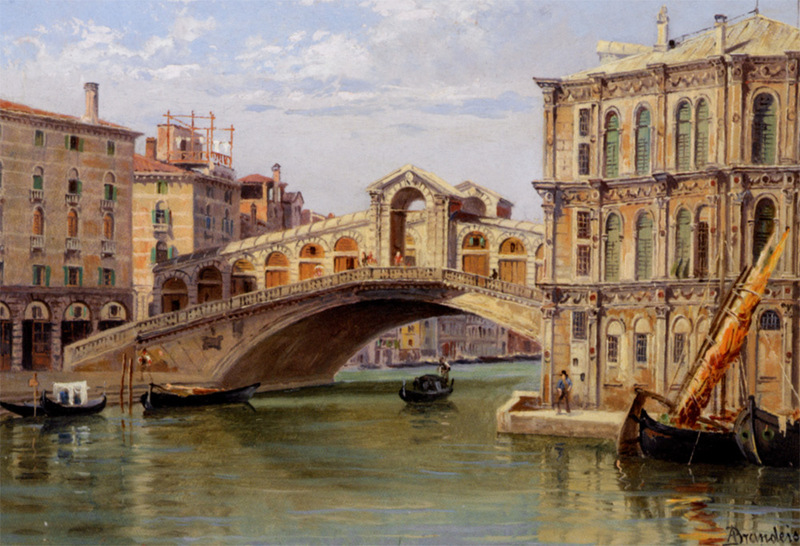 Brandeis’ continuing excellence and diligence in her artistic studies during the five years she spends at the Academy is attested to in the lists of prize-winning students of the Academy “Elenco alunni premiati Accademia Venezia in Atti della Reale Accademia di Belle Arti in Venezia degli anni 1866-1872”. It includes numerous mentions of prizes and high honours won by Brandeis in Art History, Perspective, Life Drawing, Landscape and Anatomical Drawing, Drawing of Sculpture, and “Class of Folds”. 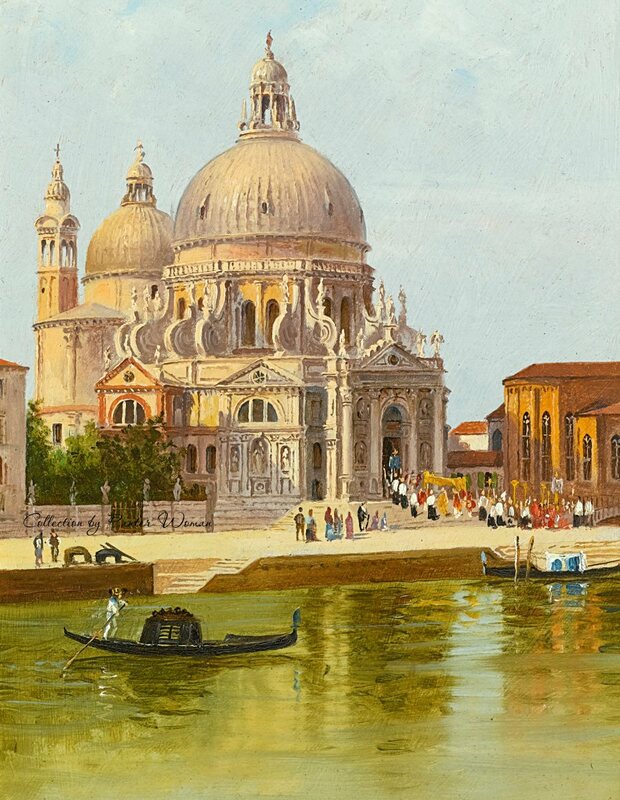 It is in Venice at the Academy that Brandeis perfected her skills as a meticulous landscape and cityscape painter, with intricate and luminous details in the tradition of the eighteenth-century “vedutisti”. 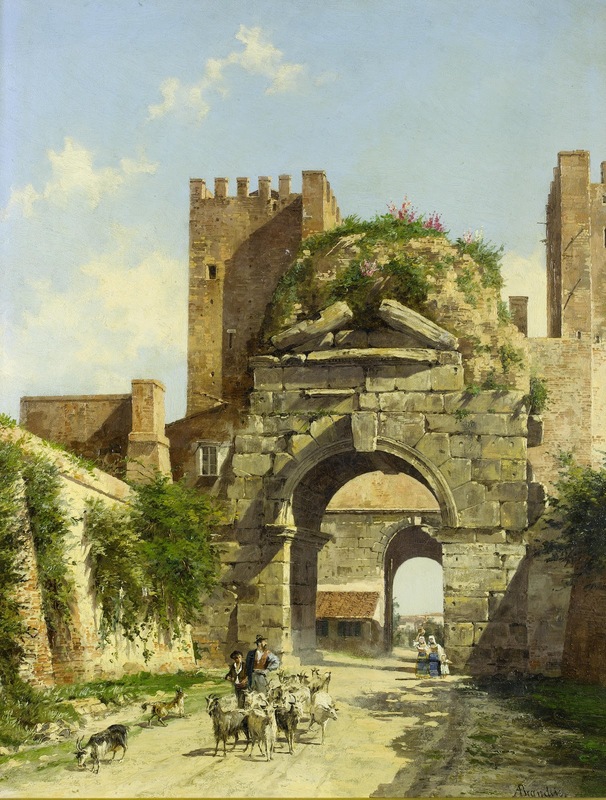 In 1870, while still a student at the Academy, she participated in her first exhibition; that of the Società Veneta Promotrice di Belle Arti with the oil painting Cascina della Madonna di Monte Varese. 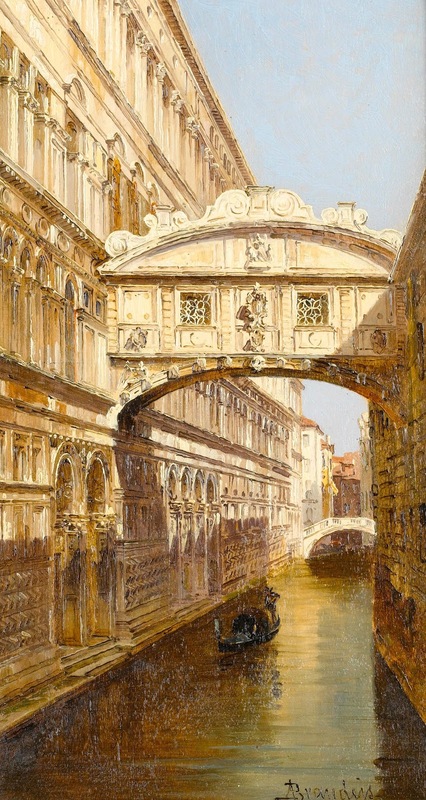 She is documented as having exhibited eight paintings during the years 1872 to 1876 with the Società Veneta Promotrice di Belle Arti, both landscapes and genre scenes. 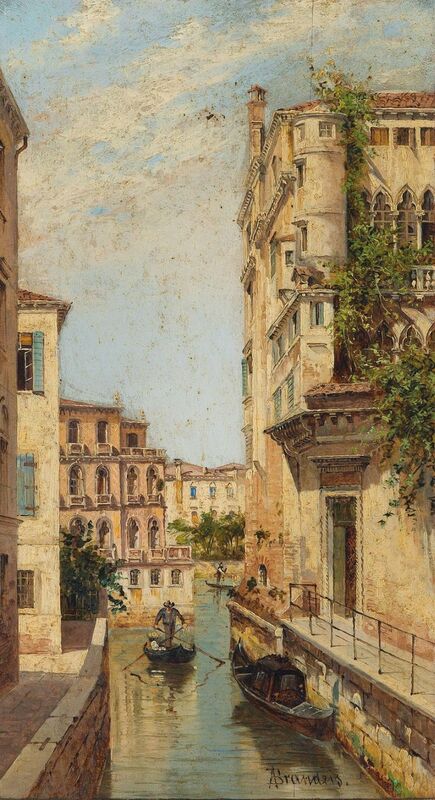 In the exhibit of 1875 her landscape Palazzo, Marin Falier is sold to M.
Hall of London for 320 lire, a first indication of the success Brandeis will achieve with foreign collectors of her work (particularly the English and German visitors to Italy on the Grand Tour circuit). 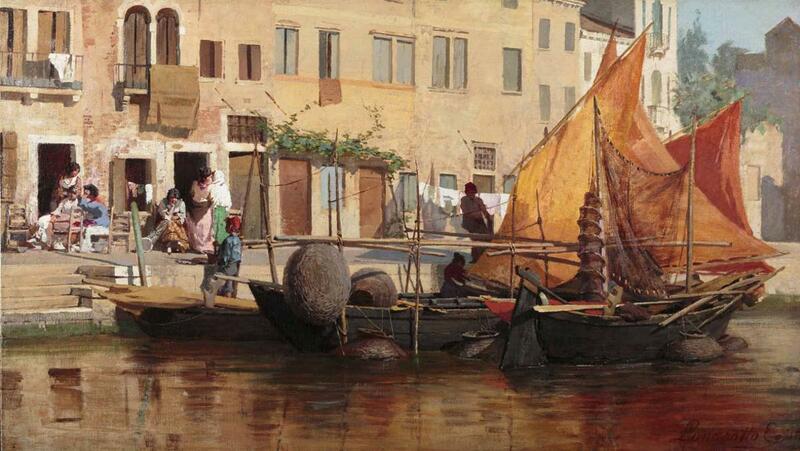 During these same years, she showed two paintings in the Florentine exhibit Promotrice Fiorentina. 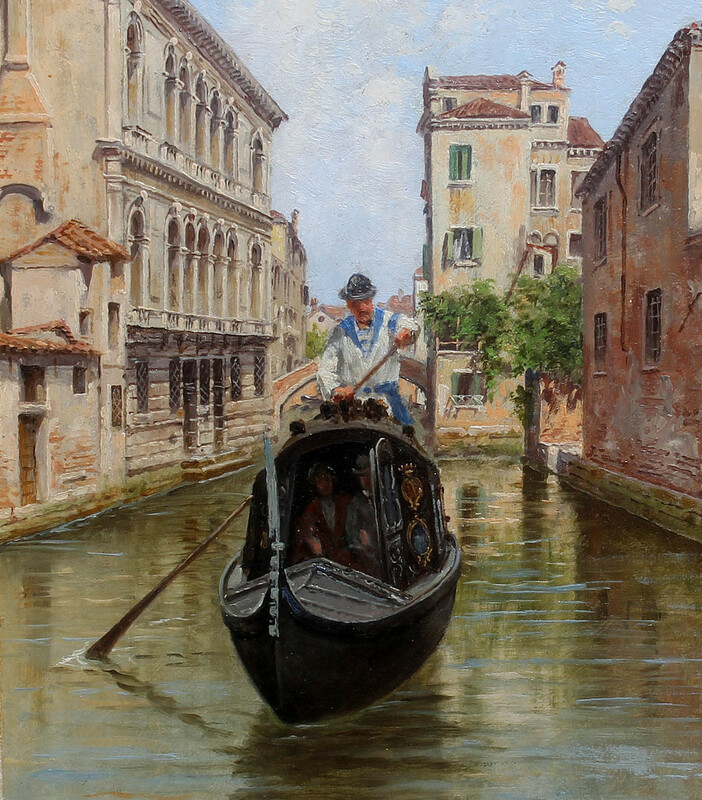 The first painting, entitled “Gondola” is a subject which she repeats in new variations throughout her career with great success. 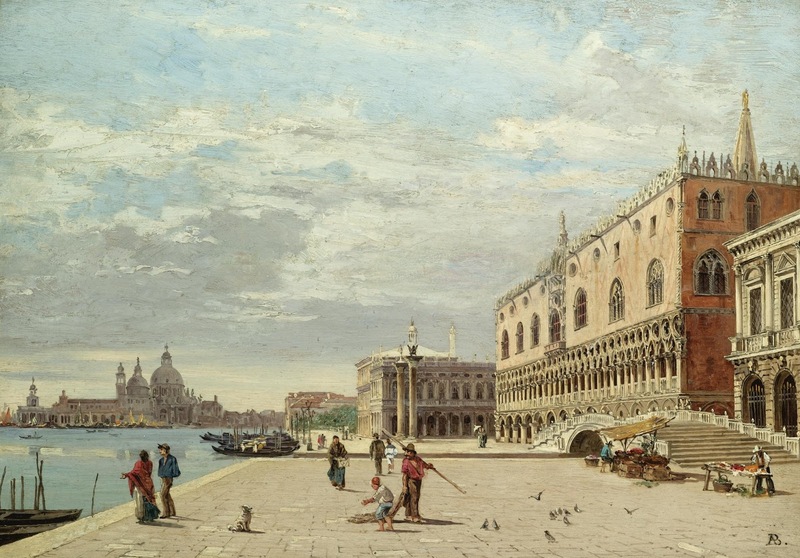 The second, perhaps a genre painting, is entitled “Buon dì !” The two paintings remained unsold and were presented at the same exhibition the following year, together with two more genre scene paintings. 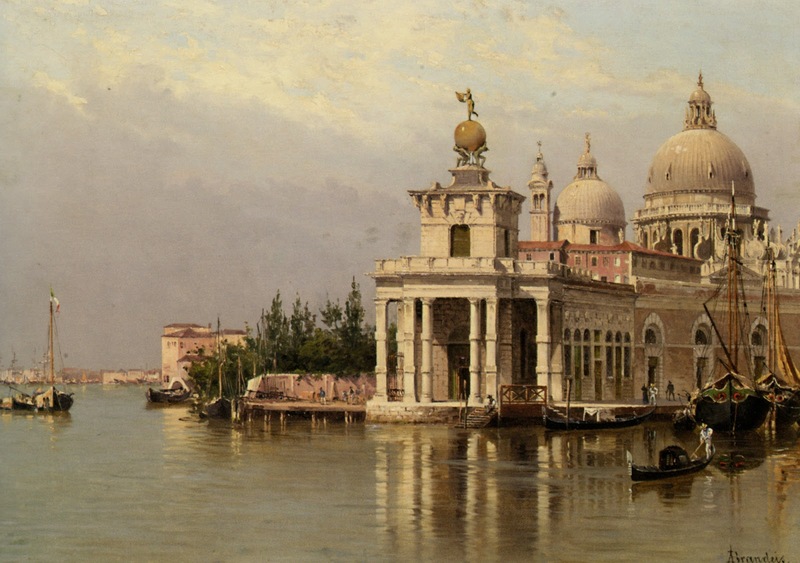 In 1876 and 1877 she exhibited three landscapes of Venice at the Promotrice Veneta, which sold to foreign collectors. 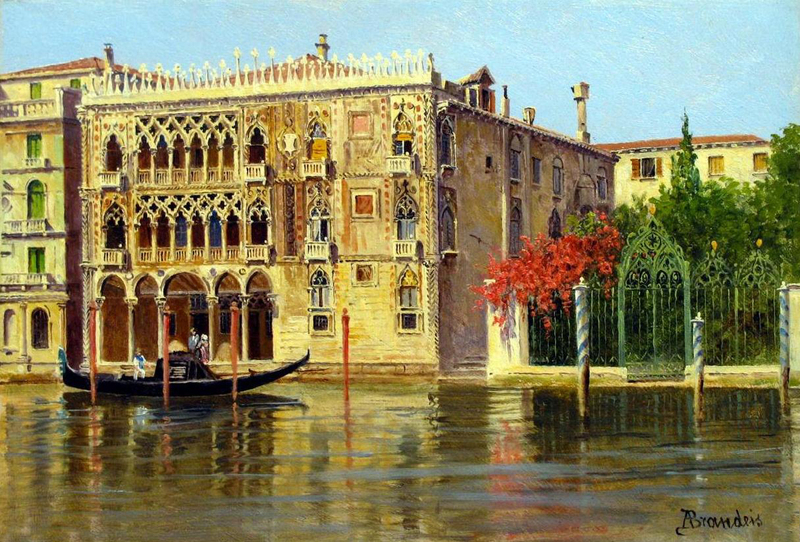 In November 1877 Brandeis showed the large painting Palazzo Cavalli a Venezia at the exhibition of the Hungarian Fine Arts Society in Budapest. 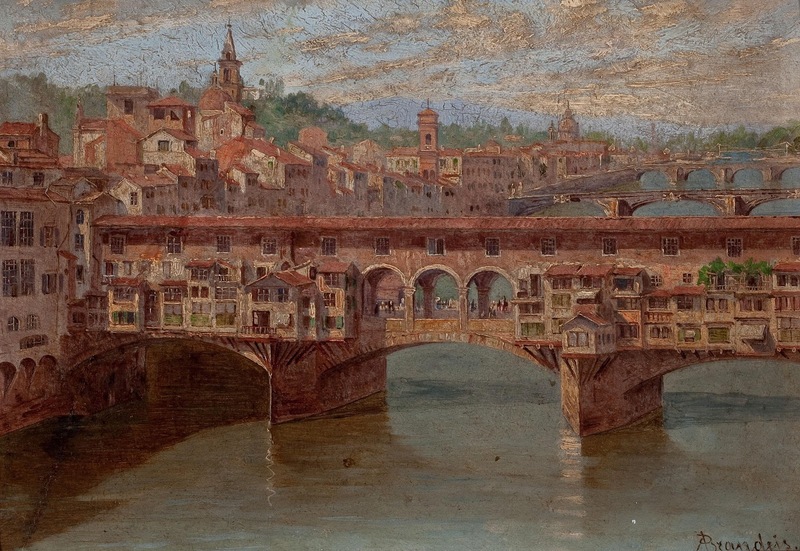 In both Florence and Budapest, Brandeis showed her work under the name “Antonio Brandeis”. The biographer De Gubernatis offers the following explanation for the change of name: "her first pictures received praise and criticism; she took the criticism, but when she was praised as a woman she was annoyed, and therefore exhibited under the name Antonio Brandeis". 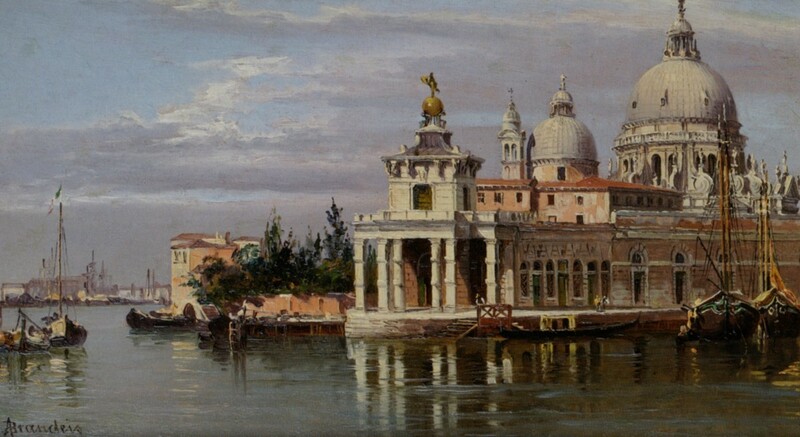 During the years 1878 to 1893 Brandeis painted and exhibited numerous works, primarily scenes of Venice, and although she resided chiefly in that city she also traveled and painted in Verona, Bologna, Florence, and Rome. 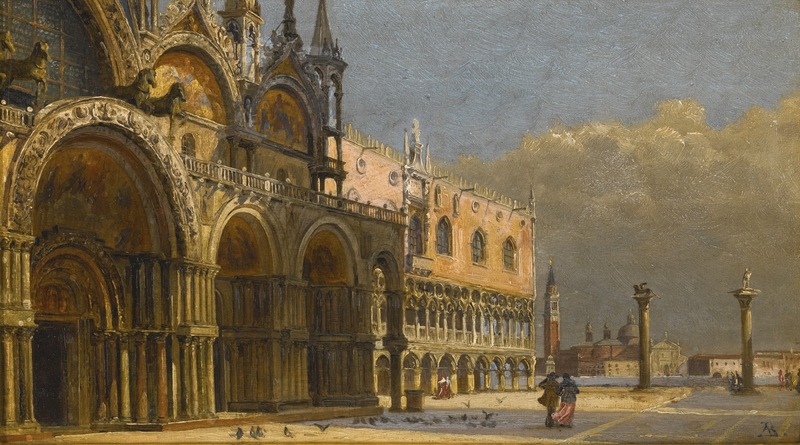 As well as in Venice and Florence, she exhibited in Turin, Milan, and Rome. 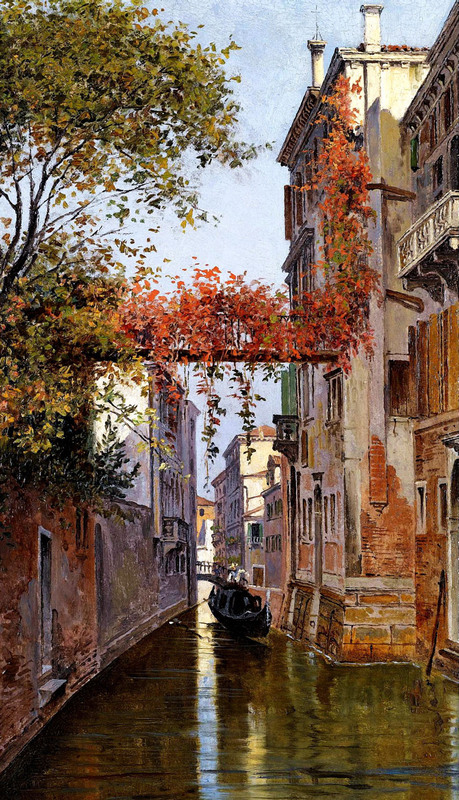 In 1880 she was present at the International Exposition of Melbourne with three paintings: Palazzo Cavalli, A Balcony in Venice and The Buranella- native of Burano Island near Venice. 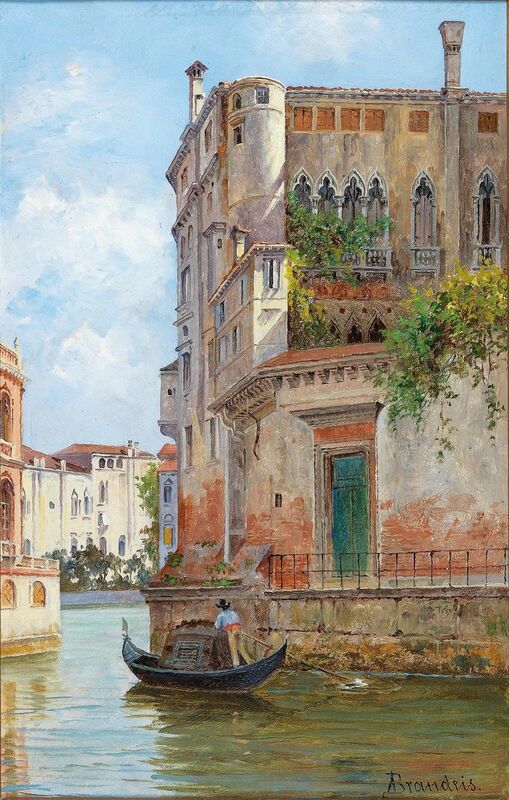 Brandeis was a prolific painter, and often replicated her most popular subjects with only slight variations. 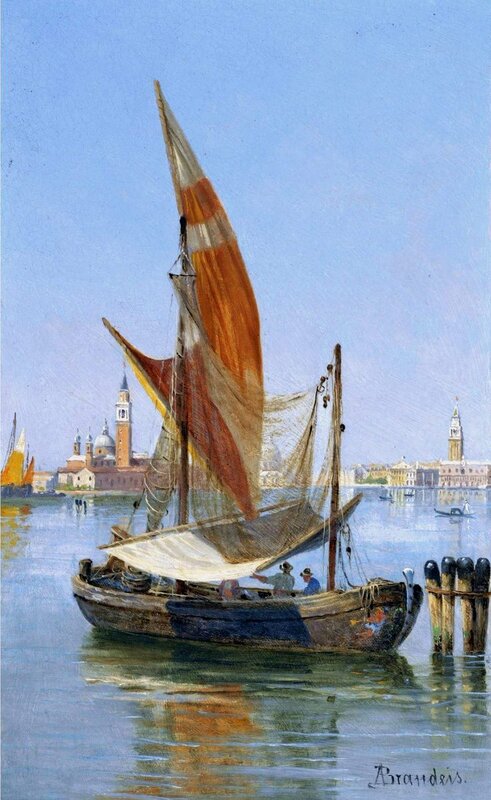 She was represented in Venice at the photographer Naya’s studios in Piazza San Marco and in Campo San Maurizio and in Florence she collaborated with the picture dealer Giovanni Masini. During this period of intense activity painting landscapes en plein air and genre scenes, Brandeis also is documented in De Gubernatis as a painter of religious altarpieces. Several of these altarpieces can be found on the Island of Korcula in Croatia. Two are visible in the parish church of Smokvici and of in the church of St. Vitus in Blato. In the sacristy of the Cathedral of Korcula is a Madonna with Christ Child painted by Brandeis. For the same church she also painted a copy of the central panel of Giovanni Bellini’s triptych from the Venetian Church of Santa Maria dei Frari Gloriosa (1488). 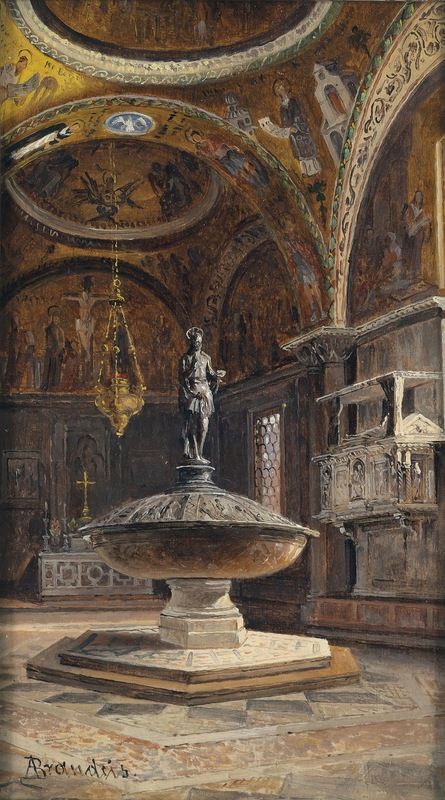 In 1899, for the main altar of the chapel of St. Luke in the Korcula town cemetery, Brandeis painted a St. Luke, which shows the sparkling colors and free impasto typical of her plein air oil paintings. On October 27th 1897 at the age of 49, Brandeis married the Venetian Antonio Zamboni, a knight and officer of the Italian Crown and knight of the Order of SS. Maurizio and Lazzaro. 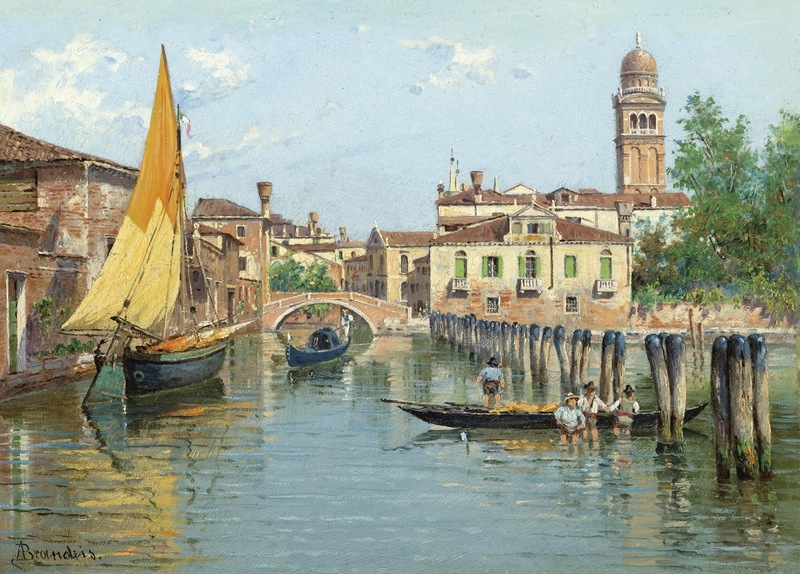 The couple continued to reside in Venice and Brandeis continued to show at Italian exhibitions in Venice, Florence, and Rome although more sporadically and with fewer works than before. 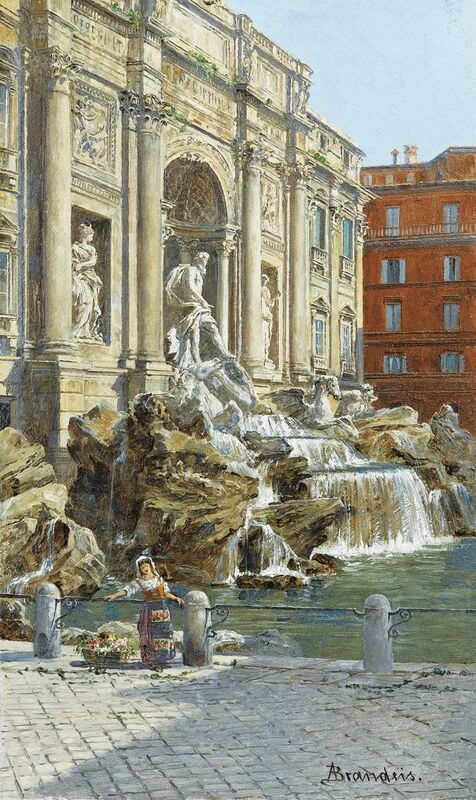 Although she participated in the International Exposition of Watercolourists in Rome in 1906 with a “Study” and in the Società Promotrice delle Belle Arti in Florence in 1907 and 1908 with two oil paintings, De Gubernatis quotes Brandeis as saying in 1906, that even though she resides in Venice “I am a foreigner, and for some time I have not taken part in Italian Exhibitions, sending all my paintings to London". 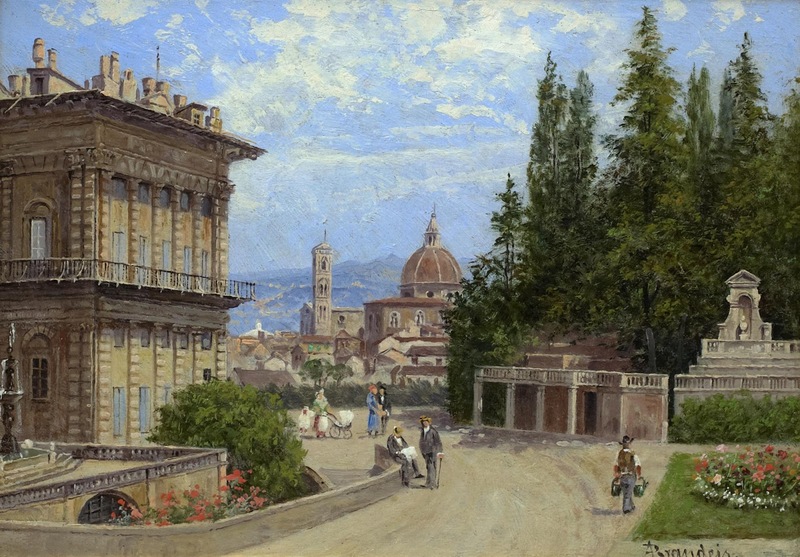 Antonio Zamboni died 11 March 1909 and from then on, Brandeis resided primarily in her Florentine home on Via Mannelli, continuing to paint in her studio there until her death on March 20th 1926. 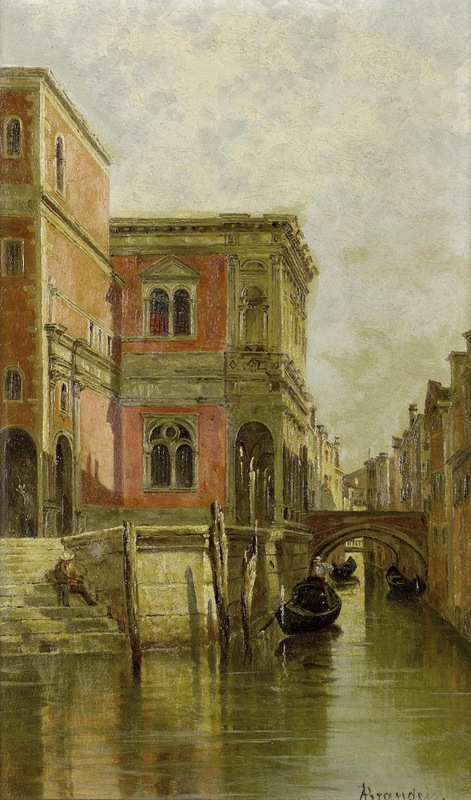 According to her last will and testament, dated 1 January 1922, and preserved in the archives of the Innocenti Foundling Hospital in Florence, Brandeis left the bulk of her worldly goods to the orphanage, including her sketchbooks and her works of art still in her possession, except for four paintings, for which she left money to be well framed and given to the Modern Art Gallery of the Pitti Palace. Laura Capella, daughter of her dear friend and fellow artist Giulia Capella, painted the portrait of Brandeis in 1924 which hangs in the Benefactors Room of the Innocenti Institute. 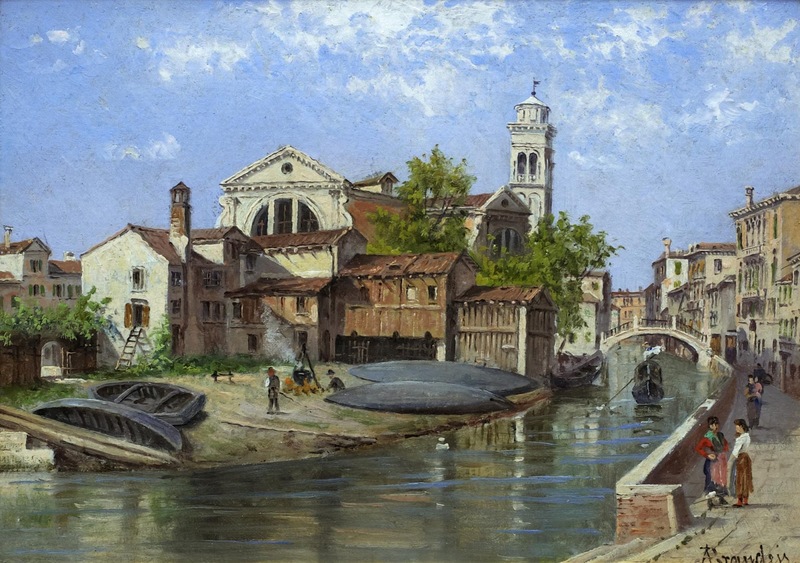 Most of Brandeis' belongings, including her artworks, were sold at public auction in December of 1926, but the Innocenti Institute still conserves at least twelve of her oil paintings, as well as numerous watercolors and sketchbooks, which provide much information about the artists painting technique. 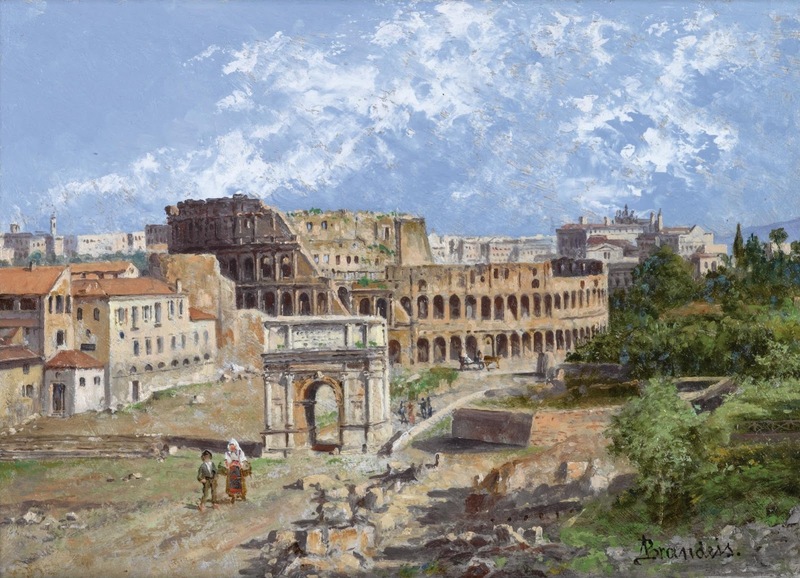 As well as at the Innocenti Institute and the Gallery of Modern Art at the Pitti Palace in Florence, Antonietta Brandeis’ works are in private collections in many parts of the world. 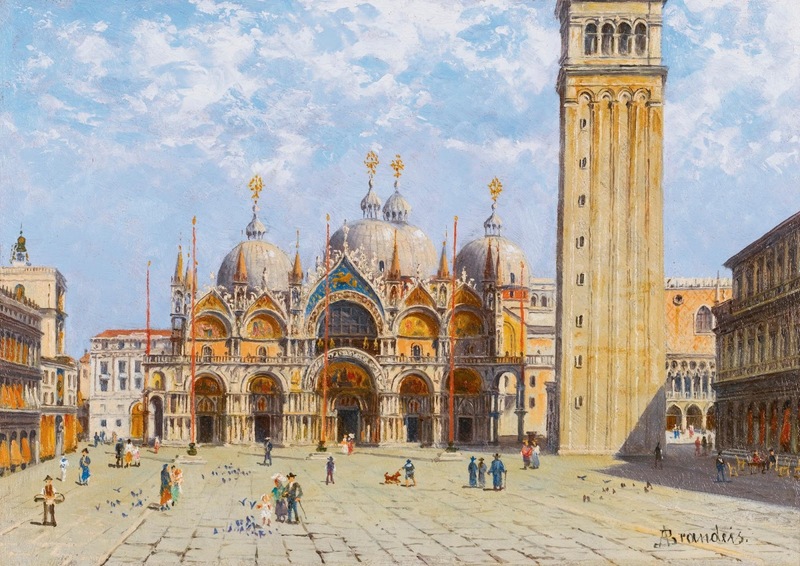 Her works can also be found at the University of Virginia Art Museum, the Gloucester City Museum and Art Gallery, the Revoltella Museum in Trieste, and on the island of Korcula, Croatia (in the chapel of St. Luke in the Korcula town cemetery, the Cathedral of Korcula, St. Vitus Church in Blato and the parish church of Smokvica). 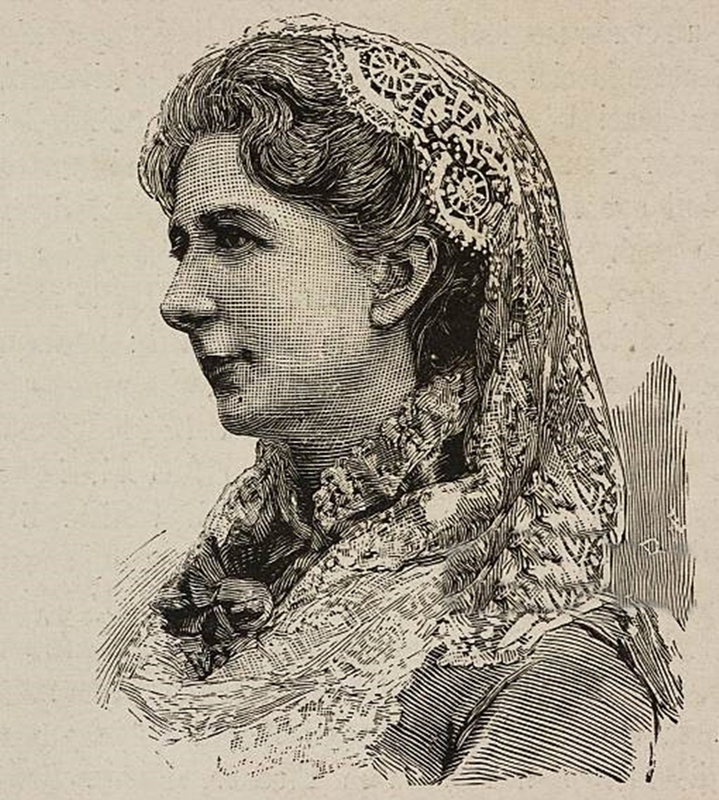 Antonietta Brandeis (Miskovice, 13 gennaio 1848 - Firenze, 20 marzo 1926) è stata una pittrice Italiana**. Fu autrice di ritratti e di pale religiose. Nata in Boemia, a Miskovice, l'adolescente Antonietta è menzionata come pupilla dell'artista praghese Karel Javůrek. Dopo la morte del padre, la madre Giuseppina Dravhozvall si sposò con il veneziano Giovanni Nobile Scaramella; apparentemente la famiglia si trasferì poco dopo in laguna. 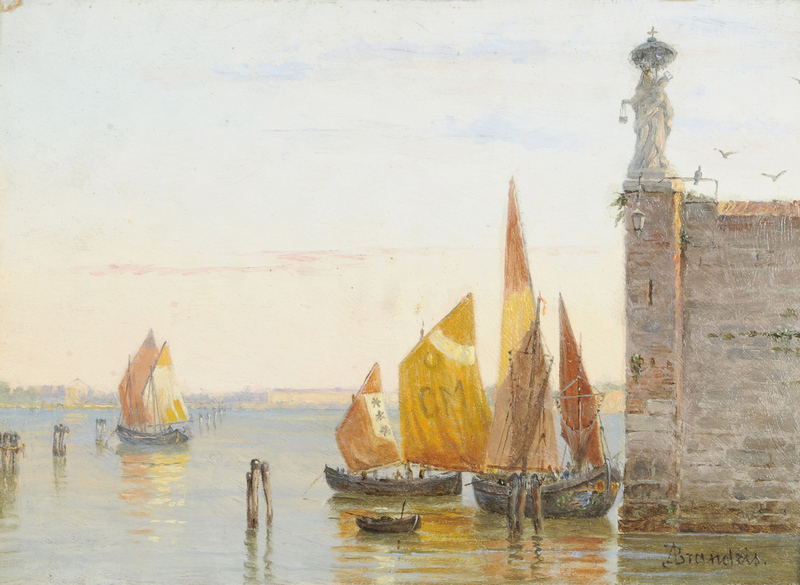 Nel 1867 entrò nell'Accademia di Belle Arti di Venezia, figurando come una delle prime donne a seguire lezioni di Belle Arti in Italia. 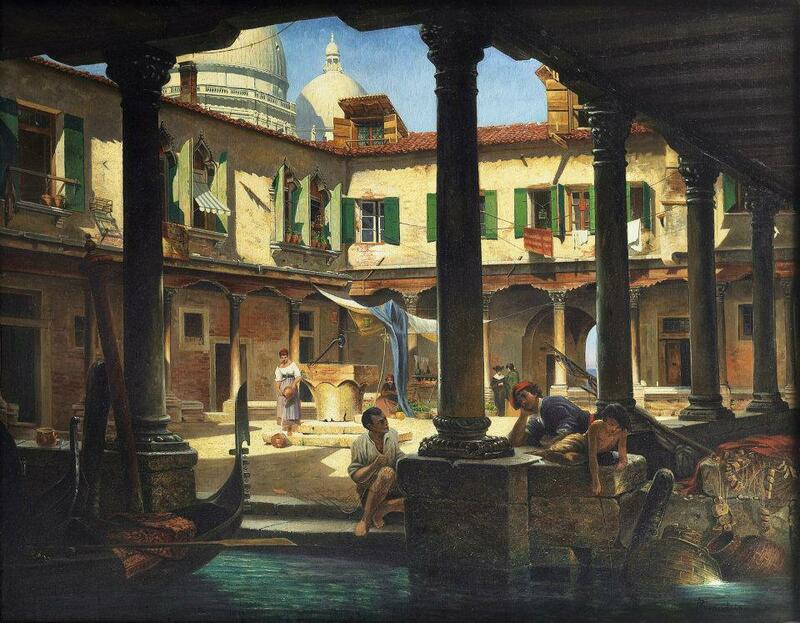 Infatti, le donne si vedranno riconosciuto il diritto legale di ricevere un'educazione artistica solo nel 1875. 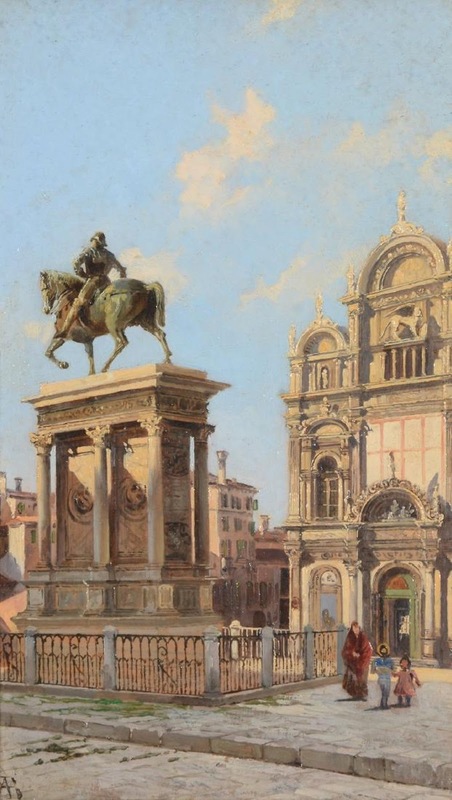 Tra i professori della Brandeis nell'Accademia veneziana di Belle Arti figuravano Michelangelo Grigoletti e Napoleone Nani, Domenico Bresolin per il paesaggio, Pompeo Marino Molmenti per la pittura e Federico Bagna per la prospettiva. Nei primi anni di studio la Brandeis diede mostra delle proprie abilità nel ritrarre scene della vita quotidiana. Brandeis continuò con profitto l'Accademia, completando dopo cinque anni il percorso didattico. 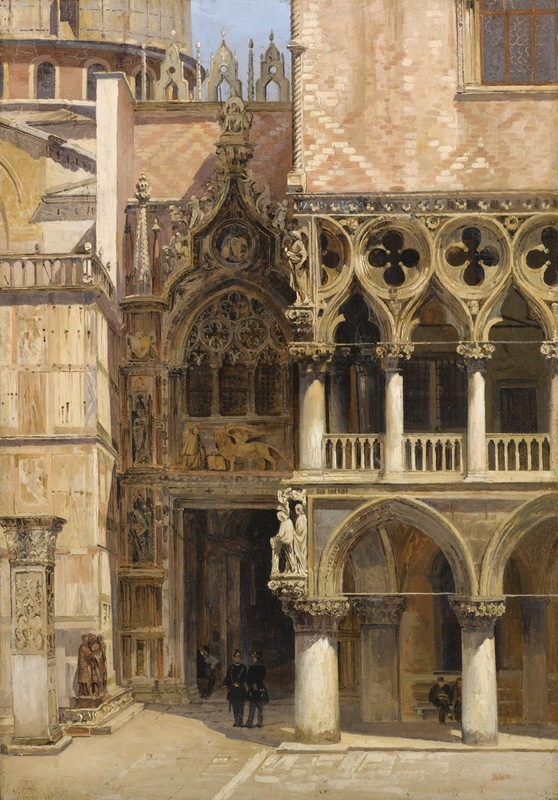 A conferma del felice periodo formativo, il suo nome compare in più voci dell'elenco degli alunni premiati negli "Atti della Reale Accademia di Belle Arti in Venezia degli anni 1866-1872". 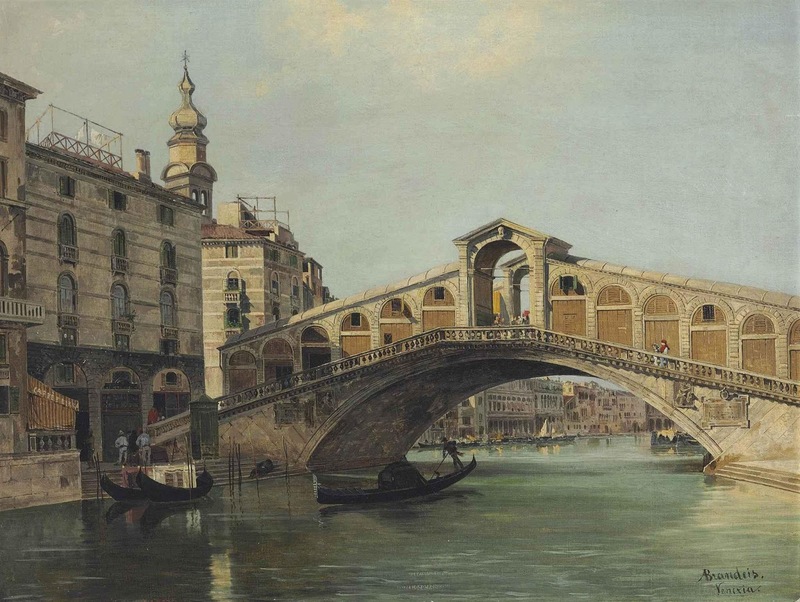 È nell'Accademia di Venezia che Brandeis perfeziona le sue abilità come meticolosa paesaggista e pittrice di città, sul solco della tradizione dei vedutisti. 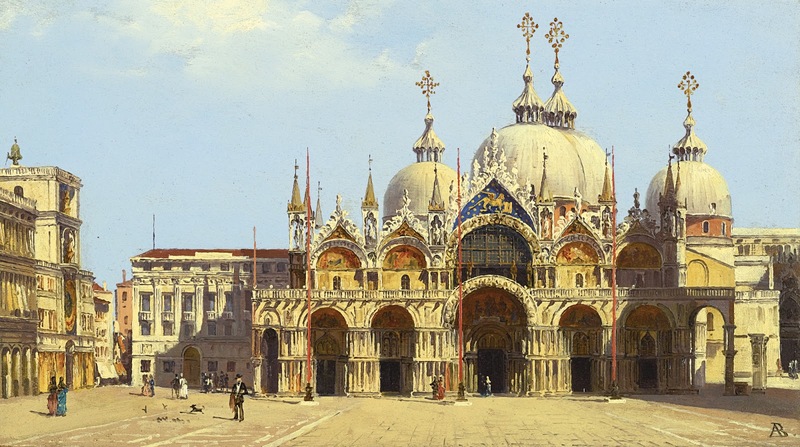 Nel 1870, ancora come studente dell'Accademia realizzò la sua prima esibizione. 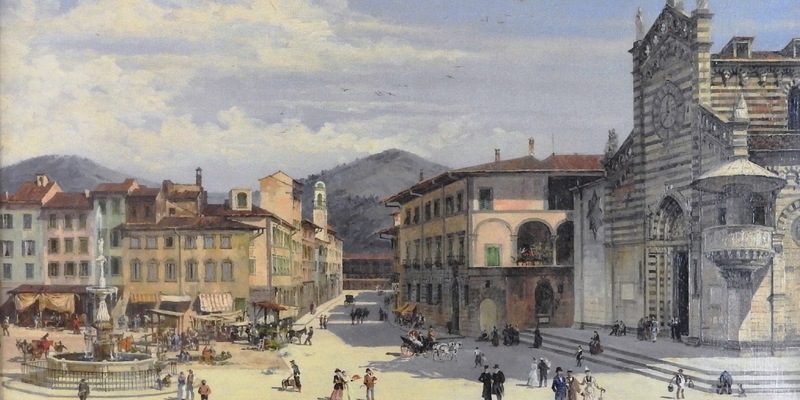 È documentato che esibì otto opere tra il 1872 e il 1876 con la Società Veneta Promotrice di Belle Arti; si tratta di paesaggi e scene di genere. 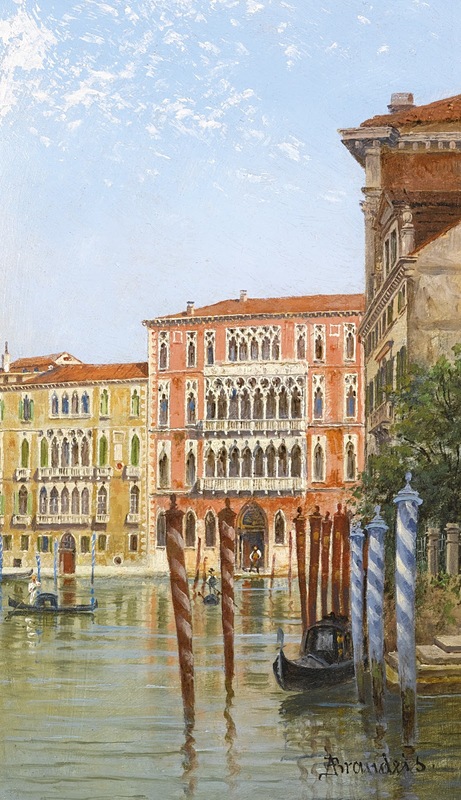 Nell'esibizione del 1875 il suo paesaggio Palazzo, Marin Falier fu venduto a M. Sala di Londra per 320 lire. 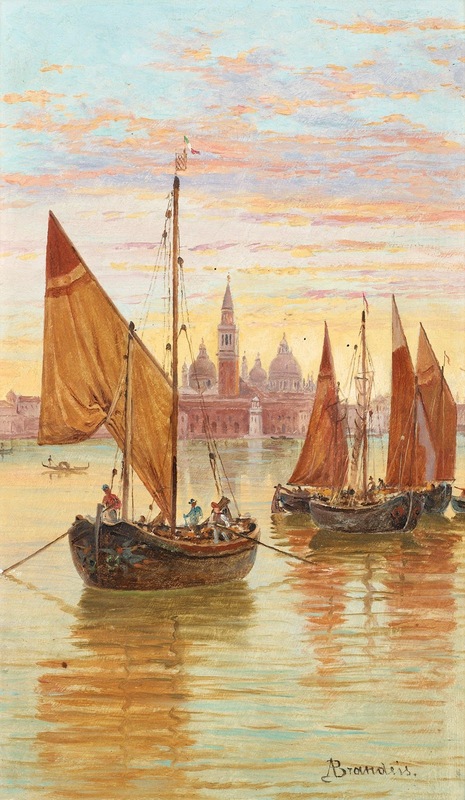 È questo uno dei primi indizi dell'interesse che l'artista avrebbe suscitato nei collezionisti stranieri, in particolare nei visitatori inglesi e tedeschi. 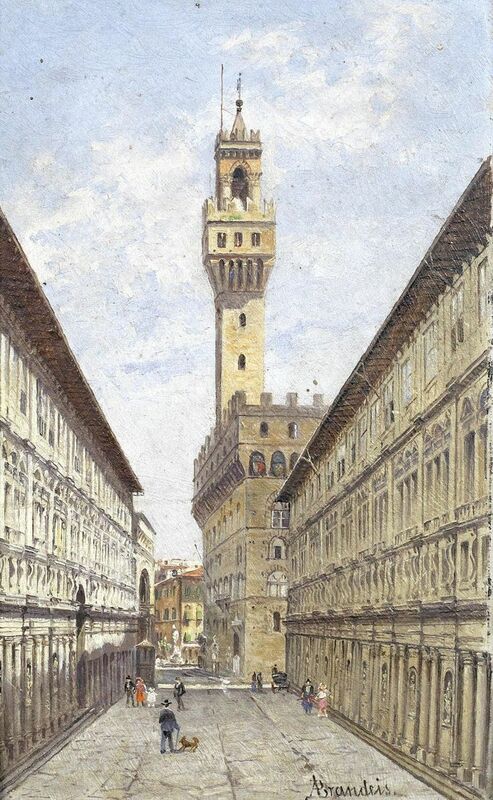 Nel medesimo periodo presentò due opere nell'esibizione Promotrice Fiorentina, a Firenze. 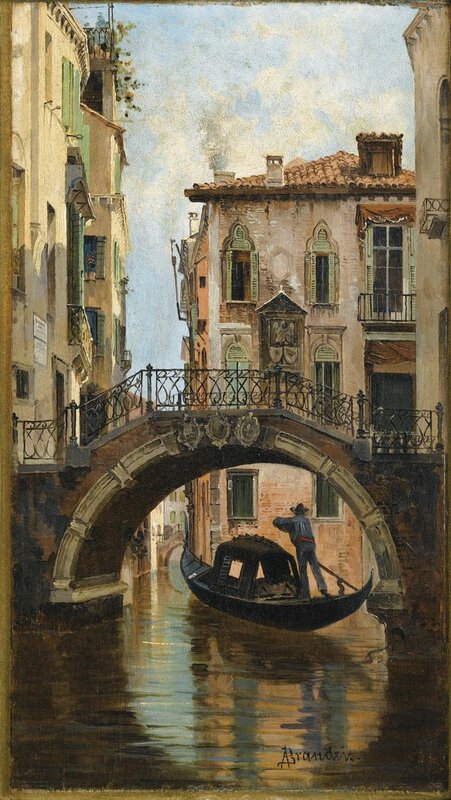 La prima si intitola Gondola, la seconda Buon dì!. Non furono vendute e vennero presentate nella stessa esibizione l'anno seguente, assieme a due opere di genere. 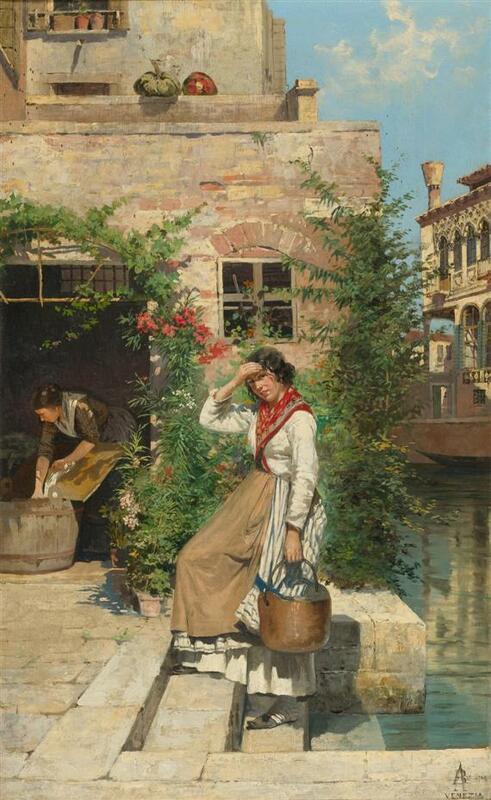 Nel 1876 e nel 1877 espose tre paesaggi di Venezia nella Promotrice Veneta, venduti a collezionisti stranieri. 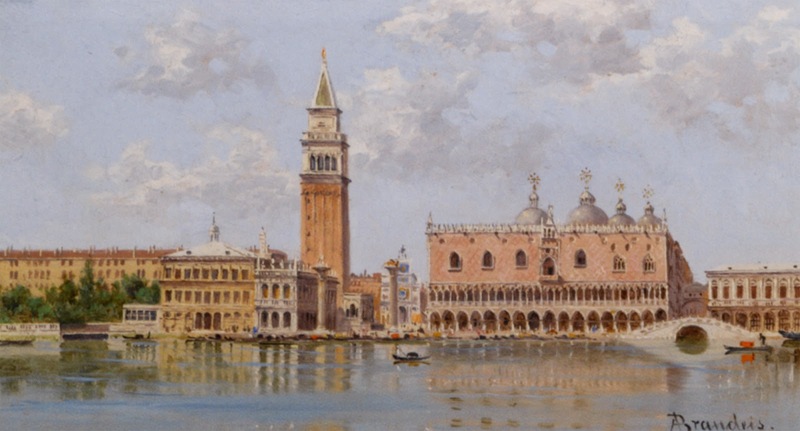 Nel novembre del 1877 portò Palazzo Cavalli a Venezia all'esibizione della Società di Belle Arti Ungheresi di Budapest. Sia a Firenze che a Budapest diffuse la propria opera sotto il nome di "Antonio Brandeis". Il biografo Angelo de Gubernatis spiegò la scelta: l'artista aveva ricevuto elogi e critiche, ma non accettò le lodi pronunciate soltanto per il suo essere donna. 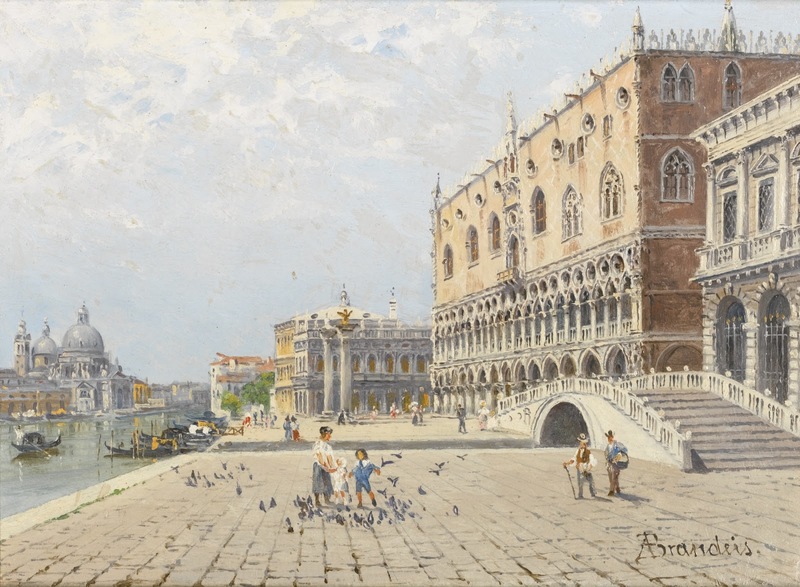 Tra il 1878-1893 dipinse e espose numerose opere, principalmente scene di Venezia, e malgrado risiedesse principalmente in questa città, dipinse e viaggiò anche a Verona, Firenze e Roma. 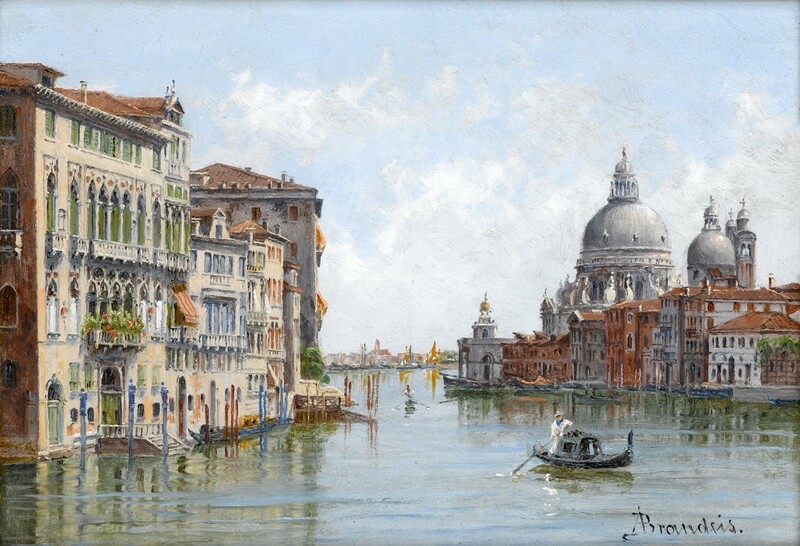 Espose anche le sue opere a Venezia, Firenze, Torino, Milano, e Roma. 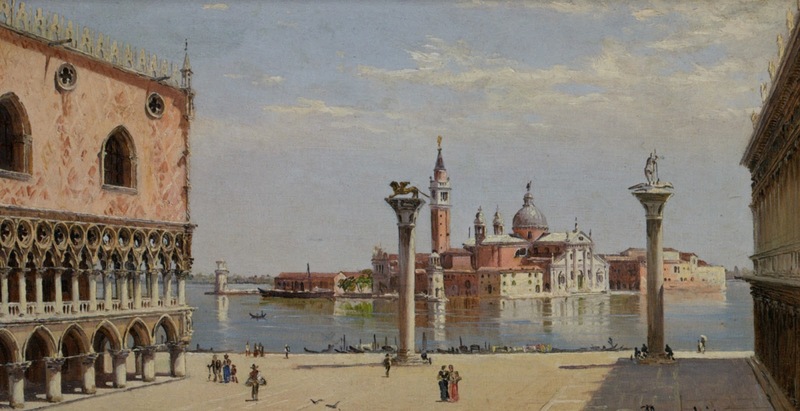 Nel 1880 si presentò all'Esposizione Internazionale di Melbourne con altri tre dipinti di ambientazione lagunare. 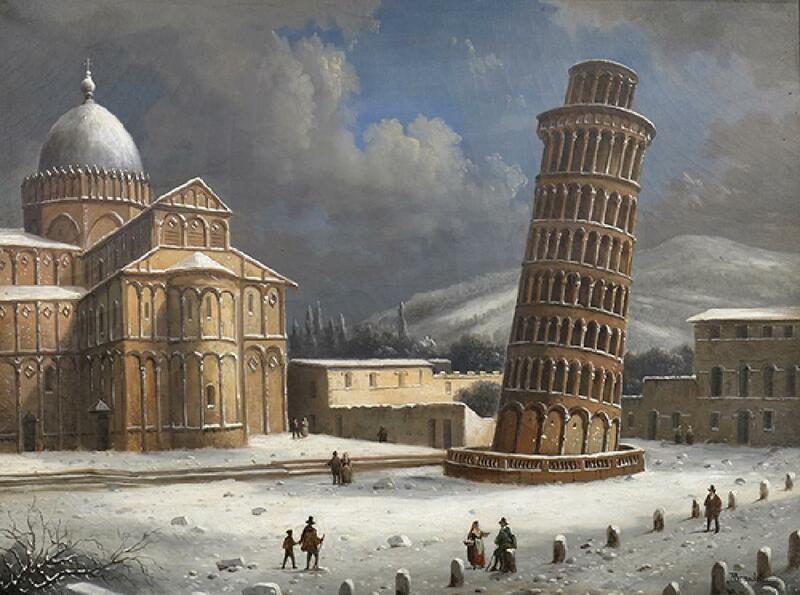 Brandeis fu una pittrice prolifica che replicò costantemente le sue opere più popolari con minime variazioni. Durante questo intenso periodo di pittura paesaggistica en plein air e scene di genere, Brandeis fu anche, secondo De Gubernatis, pittrice di altari religiosi, molti dei quali si trovano all'isola di Curzola in Croazia. Nella sacrestia della Cattedrale di Curzola è visibile una sua Madonna con bambino. 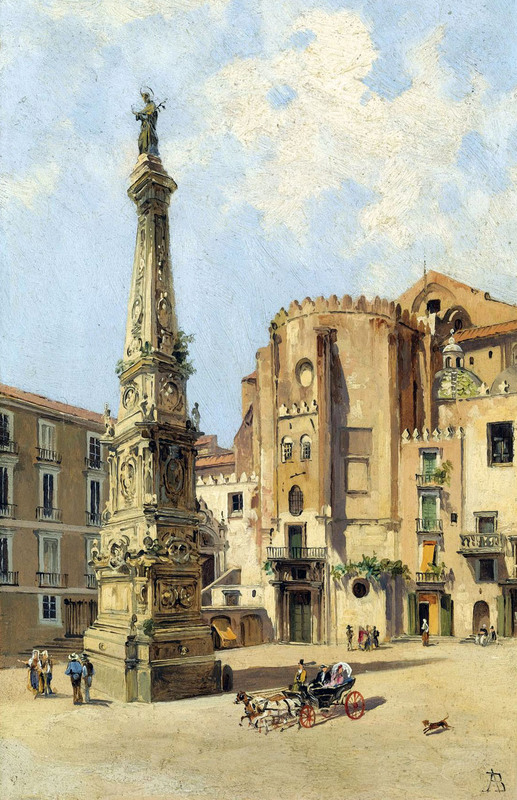 Per la stessa chiesa dipinse una copia del pannello centrale del trittico di Giovanni Bellini della chiesa veneziana di Santa Maria Gloriosa dei Frari, 1488. Il 27 ottobre del 1897 si sposò con il veneziano Antonio Zamboni, un cavaliere e ufficiale della Corona italiana e cavaliere dell'Ordine dei SS. Maurizio e Lazzaro. La coppia visse a Venezia, Firenze e Roma. 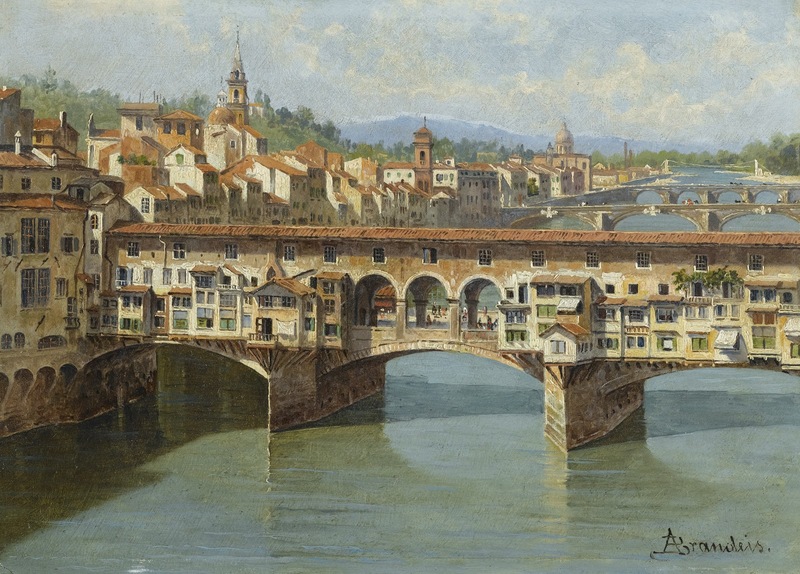 Brandeis ridusse l'attività artistica, ma partecipò all'Esposizione Internazionale di Acquerellisti di Roma del 1906 con uno Studio ed espose due opere nella Società Promotrice delle Belle Arti di Firenze tra il 1907 e il 1908. Antonio Zamboni morì l'11 marzo 1909, e da quel momento l'artista risedette principalmente nella sua casa fiorentina di via Mannelli, rimanendo attiva fino al giorno della sua morte, avvenuta il 20 marzo 1926. Di accordo alla sua ultima volontà, datato il 1º gennaio di 1922, e preservato nelle archiviazioni della Fondazione dell'ospedale Innocenti, Brandeis lasciò la maggiore parte del suo legato agli orfani, inclusi i suoi cuadernos di bocetos, le sue opere di attrezzo ancora sono del suo possesso, tranne per quattro prodotti per le quali lei lasciò denaro affinché fossero bene incorniciati e date alla Galleria di Attrezzo Moderno del Palazzo Pitti. Laura Capella, Figlia della sua amata amica e colega Giullia Capella, pintó il ritratto di Brandeis in 1924 che permane nel Salón di Benefattori nell'Istituto Innocenti. 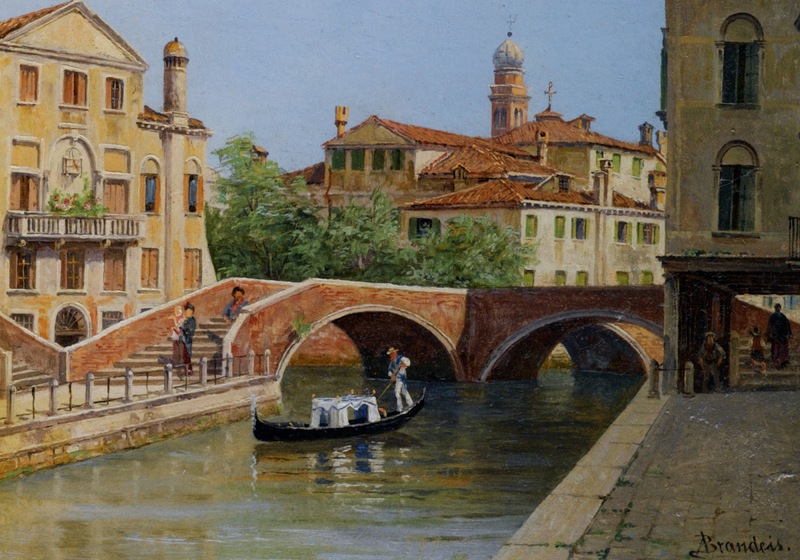 La maggioranza delle opere di Brandeis furono vendute in una subasta pubblica in dicembre di 1926, ma l'Istituto Innocenti ancora conserva almeno dodici dei suoi prodotti all'óleo, così come numerose acquerelli e bocetos, che proporcionan molta informazione sopra il tecnico e prodotto dell'artista. 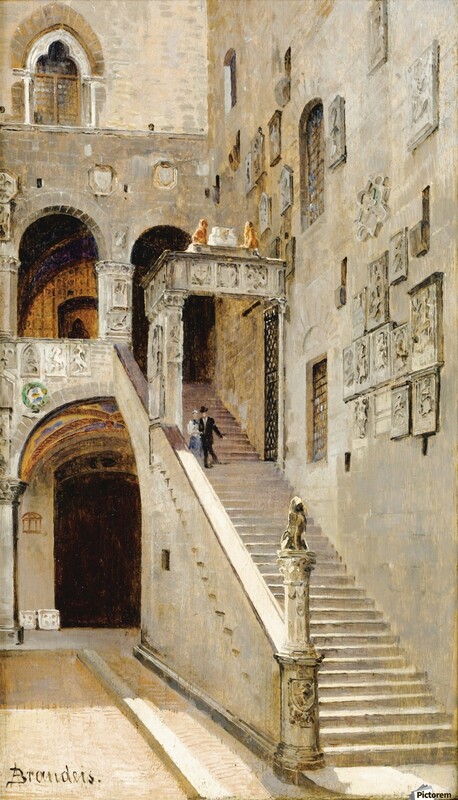 Così come L'Istituto Innocenti e la Galleria di attrezzo di il Palazzo Pitti in Florencia, i lavori di Antonietta Brandeis si encuantran in collezioni private in distinte parti del mondo. Anche Possono essere trovati nel Museo di Attrezzo dell'Università di Virginia, il Museo di Città di Gloucester e Galleria, il Museo Revoltella in Triste e nell'Isola di Korcula, Croazia (nella cappella di San Lucas, nel cimitero di Korcula, la Cattedrale di Korcula, la Chiesa di San Vitus in Blato e la Parrocchia di Smokvica).